Kit includes both a local and a remote unit. Hardened for industrial use with a tough aluminum case and an extended temperature range of -40 to +167° F (-40 to 75° C). Autosensing, autonegotiating 10-/100-Mbps Ethernet port with Auto MDI/MDI-X. Six speeds with speed indicator LEDs. Powered through a 48-VDC terminal block or a 48-VDC jack. Order power supplies separately (SDR-120-48). Supports DIN rail, panel, and rackmount installations. 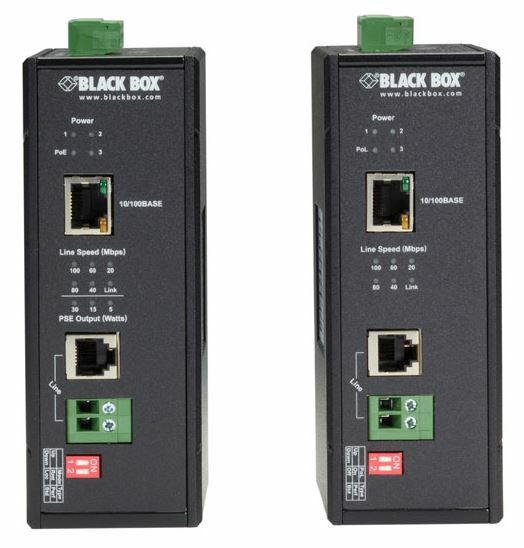 The Hardened PoL PoE Ethernet Extender Kit connects and powers PoE devices such as security cameras over one pair of ordinary voice-grade UTP cable. It enables you to save on installation costs by enabling you to use wire you may already have installed. This extender delivers the goods with up to 100-Mbps performance at up to 300 meters. Plus, even at a distance of almost three football fields, it powers 802.3at PoE devices with a full 30 watts, so high-powered devices like PTZ cameras can get the power they require. At longer distances, speed and power go down, of course, but you can still get full power by using a separate power supply with the remote unit (see the chart below). The extender is hardened for industrial use with a tough aluminum case that keeps out dust and debris. It features an extended temperature range of -40 to +167° F (-40 to 75° C). The extender mounts on standard DIN rails and accepts standard 48-VDC power via terminal block. For redundant power, the terminal block has a second power input or you can use the 48-VDC power jack. NOTE: The LBPS310A-KIT does not come with a power supply. Order the DIN Rail Power Supply, 120 Watts, 48 VDC (SDR-120-48) separately.